What do you buy for the person who has everything? Steve Richardson has spent the last four decades answering this question, usually with some variation on the following: hours and hours of diabolical jigsaw-puzzle-induced agony. The owner and self-described Chief Tormenter of Stave Puzzles, Richardson designs beautiful, infuriating puzzles for the rich and famous. The Norwich, Vt.-based company counts Bill and Melinda Gates and Barbara Bush among its most devoted customers. Musical composer Stephen Sondheim gives the elegant, cherry-backed puzzles to his cast and crew on opening nights. Even Queen Elizabeth II has a pair of Stave puzzles, which never feature an image on the box, the better to keep puzzlers guessing. 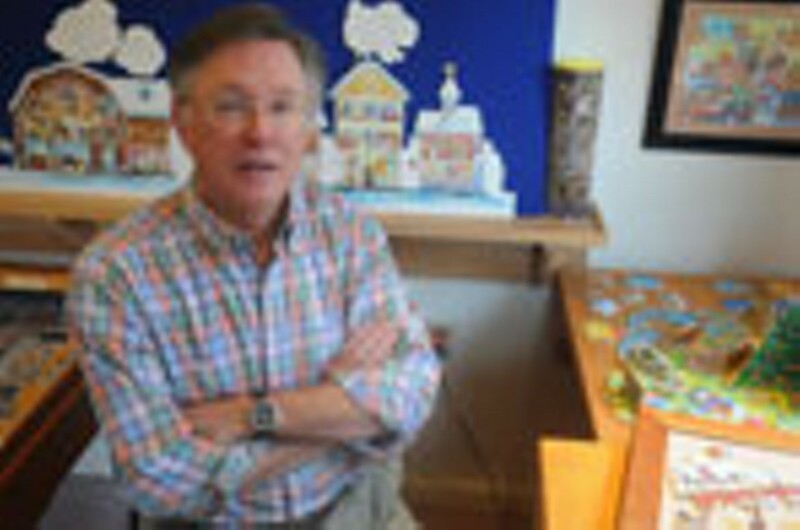 “I’m out to entertain the best and the brightest,” says Richardson, a 73-year-old computer scientist who never thought the puzzle company he started with Dave Tibbetts 38 years ago would last, let alone dominate the über-niche market for high-end custom puzzles — from a small workshop in Vermont. These days, Stave employs 25 people and sells $200,000 worth of puzzles a month. The workshop doesn’t look like the kind of place you’d imagine churning out luxury puzzles (which range from $145 to several thousand dollars each; either way, if you lose a piece, it’s $85 to replace it). Richardson’s office is cluttered with piles of paper, notebooks and jars overflowing with pens. Employees walk around without shoes. A TV in the cutting room is drowned out by the purr of saws as crafters cut puzzles to order, one piece at a time. But even during the crush of the holiday season, the operation appears to run smoothly. And the down-home charm of this Vermont business seems to be part of its appeal. The seeds of Richardson’s puzzle-making career were planted early. When he was 9, his grandfather gave him a Dremel electric jigsaw so he could make his own puzzles. He set up the saw in the basement of his Attleboro, Mass., home but kept cutting himself. Life went on. Richardson graduated from Colby College, where he majored in math and met Martha, now his wife and current business partner. He went on to earn an MBA in computer science from the University of Michigan. Eventually, Richardson ended up working for an accounting firm in New Jersey. On a visit to the Upper Valley in 1969 — Martha’s dad was an engineering professor at Dartmouth College — Richardson recalls, “I was walking around in a funk because I knew I had to drive back to New Jersey.” He passed the offices of a computing company and, curious, popped in. They were hiring. Richardson leapt at the opportunity to relocate, bringing Martha and their two sons with him. But six months later, the company ran out of money and laid him off. Also laid off was a graphic designer named David Tibbetts, who teamed up with Richardson to start a custom cardboard-puzzle company called Strategy House. The pair scraped by until 1974, when a wealthy Bostonian saw their ad in the Yellow Pages. He wanted to know if they ever made wooden puzzles. For many years, the guy had been a customer of Par Puzzles, a New York City-based operation that since 1932 had been producing elegant puzzles for deep-pocketed customers and celebrated families such as the Rockefellers, DuPonts and Mellons. Before Par’s founders retired in the early ’70s — the company has since been revived in Massapequa, N.Y. — it was selling puzzles for $300 a pop. Richardson and Tibbetts sold their 500-piece cardboard puzzles for $3 each. When Richardson visited the Boston puzzle collector to see what a $300 specimen looked like, “I practically fainted,” he says. Back in Norwich, resolved to switch to wood puzzles, Richardson and Tibbetts set up shop in the former’s garage. Richardson acquired a saw from his father-in-law and used the Boston man’s puzzle for reference. He still needed to procure saw blades and the right wood — “This is five-ply wood, mahogany back; you don’t go to the lumber yard to get that,” he says. Gradually, the two honed their technique. And then came their new name, Stave — a hybrid of their first names and a verb meaning to break into pieces. Their big break came when they placed an ad in the New Yorker that fall. The very first customer from that ad, Richardson says, spent an average of $50,000 a year with Stave over the next 20 years. Talk about customer loyalty. According to Richardson, the guy was a “zillionaire living down in Cape Cod. He’d just given up booze, just given up smoking. And we were the next addiction.” Every day for the next two decades of his life, the fellow worked to crack Stave codes. After the first two years of Stave, Richardson bought out Tibbetts, who he says had grown bored, for $1 and a saw. These days, Stave’s reputation is akin to that of the jewelry empire Tiffany & Co., with its iconic blue boxes. Puzzle lovers know they’re getting the best when they see a Stave box. “If they don’t get the blue box with the green trim and the gold clown, they think, What is this?” Richardson says. But it’s what’s inside that really matters. At Stave’s headquarters, completed puzzles are displayed in archive drawers. Some are traditional, made with family photos. 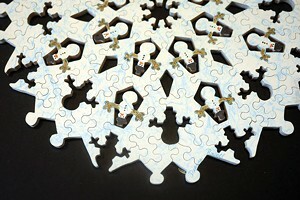 Others are composed of original commissioned artwork, such as a Nutcracker Suite puzzle with three-dimensional dancers. Others are maddening, such as a monochrome “trick” puzzle, meaning the pieces fit together many different ways, but only one way is correct. An included clue, or “biscuit,” explains how to know if you’ve found it. At least once a month, Richardson says fondly, someone calls wanting to strangle him. It might be because he used negative space to create infuriating shadows of the seven dwarves in a Snow White puzzle. “This is why I love this business, because we’re paid to drive people crazy,” he says, grinning. For Richardson, keeping people like Bill and Melinda Gates happily puzzled is an especially delicious challenge. The couple once bought one of Stave’s mystery puzzles, which come with corresponding whodunit story booklets. To advance the story, you have to make progress in the puzzle, and, when you finish a chapter, you’re instructed to call Stave to find out if your answer to the mystery is correct. Richardson came into the office one Monday morning after sending off the Gateses’ five-chapter puzzle to find five messages from Bill and Melinda on his answering machine, each one delightedly announcing a correct answer. Once, in 1989, Richardson’s devilish scheming went too far. He designed an April Fool’s puzzle made up of five simple pieces that appeared to fit together in a circle. However, each piece was cut so that, no matter how they were arranged, the last piece would never quite fit. The joke fell flat with puzzlers who were so used to being tortured by Stave designs, they figured even this one must have a solution. Embarrassed, Richardson reimbursed the 40 people who had bought the puzzle and pulled it from the market. Like any product, puzzles must be tested before they’re sold to make sure they work — and appeal to puzzlers. “We have to be careful there’s not too much chaos, that there’s puzzle integrity, so when the final piece goes in, it feels right,” Richardson says. While testing them, she may notice that the title of a puzzle doesn’t correspond with the image. Or that the pieces fit together too loosely. Or that the concept is a dud. Stave’s No. 1 source of new customers is the luxury resort Twin Farms in Barnard, Vt., which caters to a similarly well-heeled clientele — rates start at $1300. Forty Stave puzzles are distributed throughout the common spaces, and guests receive a small complimentary puzzle to take home with them. Twin Farms also hosts Stave puzzle-party weekends. The participants, who come from all over the country, “do a lot of serious, late-night puzzling,” says Jessica Johnson, a marketing/executive assistant and event coordinator at the resort. They take breaks, of course, for cocktails, meals and an outing to Stave’s Norwich workshop. “They are a first-rate business in everything they do,” says Johnson, and notes that Stave’s position as a local Vermont business “adds to the appeal” for resort guests. But he’s still adding warm new touches, such as the thank-you notes he began writing when the recession hit to customers who had spent more than $1000 in any given month. And, most importantly, Richardson says, he hasn’t lost his enthusiasm for lovingly torturing the 1 percent. “It’s still fun coming in every day,” he says.